This being Off-Topic is the perfect place to showcase my work. Now keep in mind RBLX is a kids game too so they wouldn't go full scale with realistic graphics. These are just small showcases of what I do outside Tanktastic and what I've been doin' for years as of now. I spent some time learning how to do stuff with this game engine. 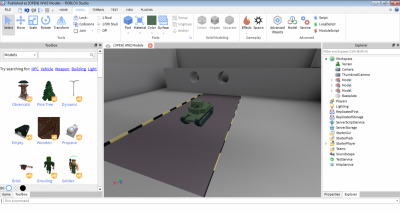 The following image features a [WIP] WoT garage and a finished M1 Light Tank/ Combat car. I'll use this thread to update my work in RBLX Studio as well. Tank was made 1 month ago. Updating now. Won't be added in-game, just a small project I made last month. It will be used in the collaborative project named Capture The Flag by me and dadysherwin2 on ROBLOX. Edited by MatrixEpic, 17 August 2016 - 09:40 AM. OUTPUT - -: MatrixCraft was here! Homethe land where it always rains. Welcome to the banter bus. Depends because I need BC for proper Server Tier based system. There will be 5 tiers and I finished organizing tech trees so the next tank is M2A4 Light tank. Just need to make its turret CSG because it is based on M1 Light tank chassis. I predict next year, in a nutshell. Yeah. Thanks!. The name M1 Light Tank showed up when I searched on Google. Edited by MatrixEpic, 16 August 2016 - 10:25 AM. Good work! Maybe you will start with Unity 3D later? Yes indeed! Though I won't start so immediately because I'm still exploring on ROBLOX Studio, maybe when I become better at scripting and programming then I'll hover over to Unity 3D and make some projects. If I do great I might end up submitting a map for Tanktastic so that people can enjoy. I'll do further work on the M2A4 Tomorrow hopefully I'll finish by tomorrow. I have a roblox account,not a scripter just a player though haha,can I beta test? Edited by Colonel-candy, 16 August 2016 - 01:08 PM. This isn't general off topic, this is general gaming. When u "publish" it, I'll try to be the first to play! I love roblox and tankblox would be even more fun. Haha yes you can be a beta tester. Though I can't promise you that proper armor calculation since I don't think ROBLOX Studio supports that just yet. Sure you and colonel would make great beta testers. Doesn't much matter. But I'll take your view mate! Thanks for posting. Yes it will be playable. However to play it you need an account in ROBLOX and you need to download the ROBLOX Client. The Status is closed since its still being made. Updated the topic with a tad bit more information. You can view my own personal created tank which is named as the LT-30 Heavy Tank. Its just the Mk.1 edition. The tank is built in such a way that it is not too huge and fits in combat in CTF. The Mk.2+ editions will incorporate better features to fit itself in combat. And yes I do agree on that. However there will be better tanks than that. But we all gotta take an inspiration right? Even though I never meant it to look like a Sarl 42. Lol I saw that now instead. Thanks for posting and yes it was a major mistake.